Een kwaliteitsaccommodatie voor wie geïnteresseerd is in bezichtiging van bezienswaardigheden, cultuur, restaurants: het Super Hotel Hakodate in Hakodate is een prima adres voor zowel zakelijke reizigers als toeristen. Op slechts 0.75 km gelegen vanaf het stadscentrum en 8 km van het vliegveld, trekt dit 3-sterren hotel jaarlijks vele reizigers. Een baken van rust en ontspanning: dit hotel is het perfecte verblijf op steenworp afstand van bezienswaardigheden als Daimon Yokocho, Omori Inari Shrine, Boni Moriya. Het Super Hotel Hakodate biedt een onberispelijke service en alle essentiële voorzieningen om reizigers een plezierig verblijf te bieden. Enkele voorbeelden van faciliteiten die dit hotel biedt zijn gratis wi-fi in alle kamers, 24-uur beveiliging, dagelijkse schoonmaak, taxi service, snel in- en uitchecken. Gasten kunnen kiezen uit 108 kamers, stuk voor stuk plezierig en comfortabel ingericht. Het hotel biedt fantastische faciliteiten, inclusief hot tub, thermaalbad , zodat u kunt onthaasten na een bezige dag in de stad. Het Super Hotel Hakodate is een slimme keuze voor mensen die reizen naar Hakodate: een ontspannen verblijf is gegarandeerd. The hotel was clean and have free onsen on the inside. They will give you password to open the room and dont need any key. Location is 10-15 mins walk from Hakodate Station. I just use taxi to get to the hotel from the station and just cost 550 yen. Hotel room is small however we managed to squeeze in all our luggages. The hotel receptionist Miwa San she is very helpful and help us to find where we can go for fruit picking. Hotel also came with Onsen. A small onsen is available at the first floor of the hotel. The room is really small that you have no space to open up your luggage. The bathroom is really small too. Buffet style breakfast is good. Parking lots are available beside the hotel with an entrance fee of 500yen Staffs are friendly and able to communicate in English. You can pick extra pillow and pyjamas for free. For summer, totally no problem. Pls be reminded full of snow on the street, it will be a little bit difficult when carry on baggage. From Hakodate JR station to hotel takes 8-10mins by walking. Visited Hakodate during Japanese New Year, hotel located at very great location McDonald, Pharmacy, Convenient shop and tram station within walking distance (basically just opposite of road. 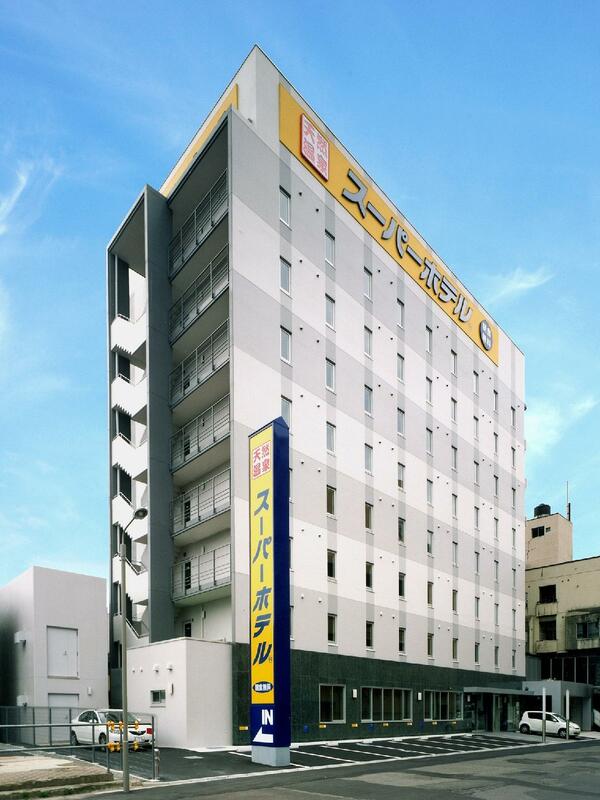 Hotel located not far from Hakodate station, very convenient. Staffs are friendly, our room very clean. Had a pleasant stay here, we were first greeted by friendly and polite staff and was guided to our room. Breakfast was simple, variety wasn’t much but the food quality was great! Will definitely be back here again. check in and found the blanket clearly with blood stain mark. loss hair on the floor n bed as well. had inform to receptionist. A senior citizen staff offer to shift to other room with better and cleaner. however we have drop all our luggage and everything. just request to exchange blanket. Please ensure the room must well clean before handover to customer. Nice hotel and kindly staff, but spa which is too small If beyond 3 people. Nice breakfast and onsen. will come again! Location of the hotel is a 10 min short walk from Hakodate Train station and MacDonald is just across the road. Checking in and out was easy and the breakfast provided is simple and nice. Room is very small and compact but well organized with nice details, however if you're huge then I suggest opting for other hotel with bigger room. Basically a business hotel but nice onsen pool located on the ground level and special mention on the reception staff ,they're friendly and helpful too Recommend this hotel for single traveler, couple with small luggage. Great spread of japanese bfast buffet, clean room, attentive receptionist and walking distance from Hakodate Station. Have onsen that runs by "gender-shift"; pajamas supplied for all patrons, and you may choose the pillow from library of pillows. Good value for money. However its too small for 3 adults, especially with the luggage. There are no space for the luggage, hard to move around. Easy to access by tram, 1 station from JR, 10-15 mins walk. Convenient to stay. Pros...own onsen buffet breakfast is delicious near the tram water is ionized great for the skin and to drink very clean and accomodating staff! Good breakfast and very friendly and helpful staff. Good breakfast. Clean and comfortable. Staff are very nice. The only thing i don't like is the room is too small. Our luggage cannot open completely, you can imagine how small it is.